What if you could hear everything that you needed to without having to spend a fortune on hearing aids? Our BTE Hearing Amplifiers are sold in a pair which means that you'll be able to enjoy the miracle of hearing again in both ears. Not only that but you'll be able to hear without damaging your ears. Because these BTE Amplifiers feature a digital volume controller and max sound alarm with active noise reduction you can keep your ears safe. Why Wait!? Click "Add to Cart" to order your Premium Digital Ear Amplification Device today! AMAZING! HEAR EVERYTHING WITH CLARITY: Imagine being able to hear anything you need to, without damaging your ears. If you've been looking for a device that allows you to hear everything without damaging your ears, then your search is over! That's because our behind the ear sound amplifier has a digital volume controller with memory function and a max sound alarm with active noise reduction, which means you'll hear everything you need to safely, guaranteed! USER FRIENDLY! NO PROGRAMMING:The problem with other Amplifiers is they have high frequency feedback and aren't user friendly. Our digital ear amplification device solves that problem! Why? Because our Hearing Amplifiers were made with ergonomically designed ear tubes and a digital processing volume control and memory. 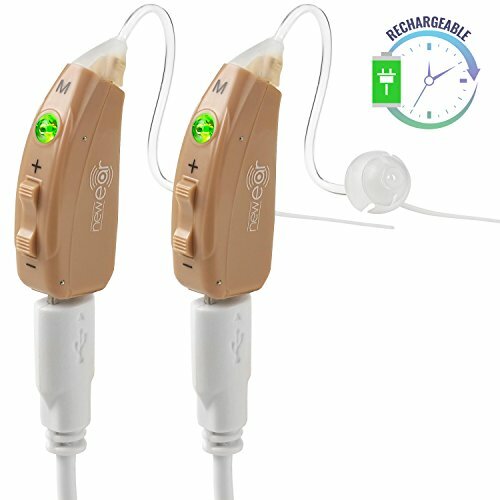 Because we make our premium rechargeable hearing amplifiers in this unique way it means you won't have to suffer that obnoxious feedback and there's almost no learning curve!